Apple iPhone X is one of the best mobiles available in the market. Being stunningly beautiful and super-slim, it needs maximum protection against scratches, bumps and sudden falls. You can find a variety of iPhone X wallet cases in the market, and you can choose any of the best iPhone X wallet case. Apple iPhone X comes in a stunning Jet-black variant and embraces features like stereo speakers, water & dust resistance, better display and camera perfection. We use our phone in many ways like capturing pictures and communication with our friends. The case we are mentioning here for your Apple iPhone X is the Caseme iPhone X Wallet Case. 1. The iPhone X wallet case has been especially designed in Britain to best combine stylishness and handiness. 2. It protects your iPhone X against sudden falls with smart rubber padding that absorbs impacts and softens falls. 3. The wallet case features a tough internal shell of the bumper cover being attached to a leather pocket. 4. It holds your precious iPhone X comfortably and firmly. 5. The case is perfect for daily use, and is designed to resist moderate falls. 6. Its buttons are covered to ensure the mobile’s protection against dust and scratches. 7. A projected lip safeguards the mobile’s touchscreen from scratches. 8. The lightweight leather wallet is strong and gives you a good grip on your gadget. 9. The Caseme holds up to 10 cards with a front pocket for quick access to two cards, and the larger pocket holds up to 8 cards. 10. 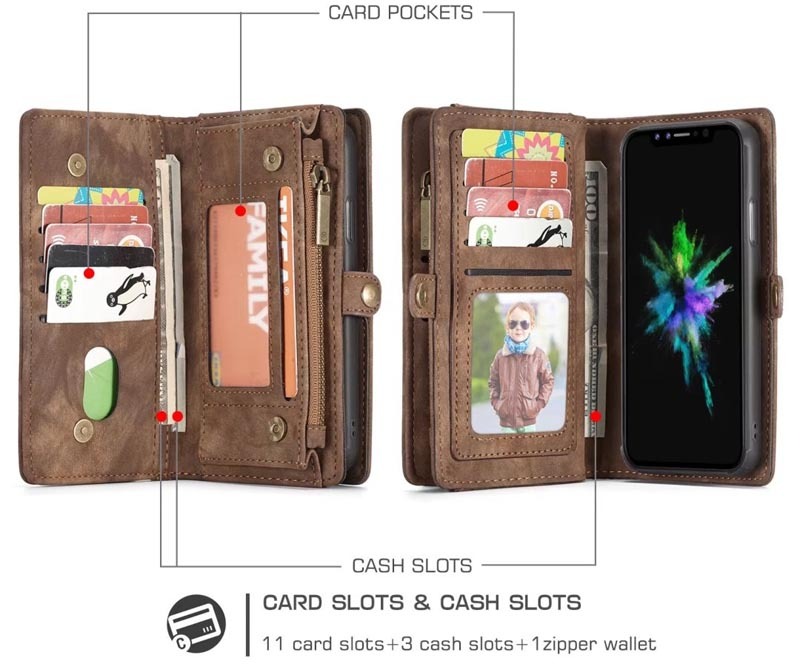 The magnetic flap of the iPhone X wallet case ensures the wallet section remains closed firmly. 11. It is one of the most dazzling iPhone X wallets cases for your phone. 12. Your phone gets protection from shocks, and in case, it falls on a tough surface, the risks of damage are the minimum.